The Ministy of Health (MOH) conducted a joint mission on 2 August with the World Health Organization (WHO) and other partners to evaluate the situation in the Mangina health area, where the majority of the cluster of new Ebola cases have been detected. They met with local authorities, including the Mayor of Beni, Mabalako health zone chief and other members of the community to discuss the best way to respond to the outbreak. “All the pillars of the response are ready to be implemented to fight this new outbreak in Beni and areas,” said Dr Oly Ilunga, DRC Minister of Health. A strong multidisciplinary team will be set up quickly in Beni and in Mangina under MOH leadership and coordination, he added. 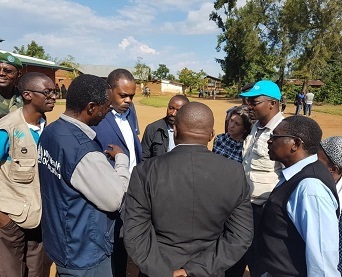 The Minister of Health, the Governor of North Kivu and representatives from the Ministry of Health, WHO, UNICEF, MONUSCO, the World Bank, the Deputy Humanitarian coordinator, and dozens of health experts participated in the joint mission. “WHO is deploying more than 18 experts including epidemiologists, logisticians and experts in Infection Prevention Control, risk communication, social mobilization and community engagement from Goma, Kinshasa and Mbandaka to support the Ministry of Health to stop rapidly the Ebola virus from spreading,” said Dr Allarangar Yokouidé, WHO Representative in the DRC. “Surveillance measures at all entry and exit points between Beni and other major cities are also being strengthened to ensure daily follow up of contacts of 4 confirmed cases to break transmission chains,” he emphasized. Mr. Julien Paluku, North Kivu Governor also launched a message campaign via radio and television to reinforce hygiene and prevention measures in the community. He urged and encouraged safe burials during this outbreak.